Congratulations to our very own Stephen Somerville. 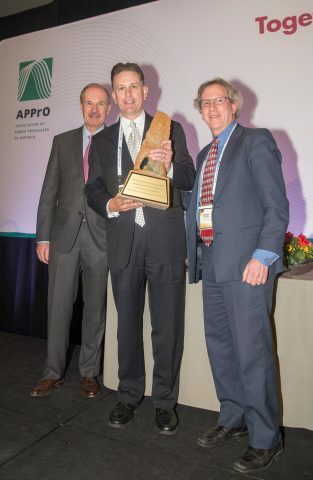 On the evening of November 19th, 2018, during the banquet dinner of the Association of Power Producers of Ontario (“APPrO”) annual Conference in Toronto, Stephen was presented with the Hedley Palmer Award by APPrO President David Butters (left side of photo) and APPrO Chairman Michael Bernstein. The Hedley Palmer Award is a special recognition presented annually to only one individual. The Hedley Palmer Award is named after the late Director of Marketing at Ontario Hydro. Mr. Palmer took a number of steps internally and externally that helped prepare Ontario Hydro to deal with other power suppliers besides itself, which eventually led to the beginning of the Non Utilities Generation program in 1988. This prestigious award is to honour individuals that have made outstanding contributions to the Ontario power industry. Stephen was presented with this award due to his work in the sector and in recognition of his ten years as the Chairman of the annual APPrO Conference, which is the largest such power conference in Canada.